Real Madrid and Barcelona tied 1-1, but the Blaugrana are through to the UEFA Champions League Final, due to the 0-2 advantage lead from the last clash in the Santiago Bernabéu. The referee Frank de Bleeckere disallowed a very controversial goal to Higuain, after a great run by Cristiano Ronaldo, that ended with CR7 falling over Mascherano. 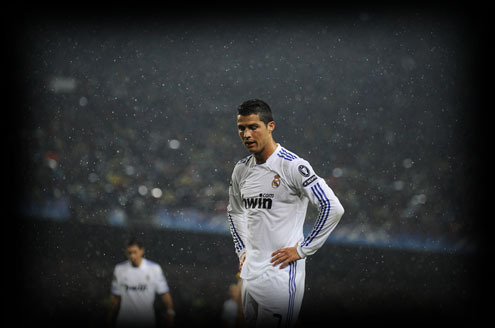 Real Madrid got eliminated from the UEFA Champions League semi finals, after a 1-1 tie in Camp Nou, against Barcelona. After last week's defeat by 0-2 in the Santiago Bernabeu, the Merengues knew they would need an epic and remarkable performance to turn around the outcome of this round. The last "El Clasico" of the season, was once again stained by several controversial referee decisions and the most flagrant was a disallowed goal to Gonzalo Higuain, after an individual run by Cristiano Ronaldo, that ended with CR7 falling over Javier Mascherano. The game was still 0-0 by the time of that incident and perhaps that could have been the turning point to a memorable night. It was on a very rainy night that Barcelona and Real Madrid measured their strenghts for the fourth time in the last 20 days. The game started with Real Madrid pressuring and trying to fight with Barcelona for the ball possession, but as time passed, the Blaugrana dictated the tempo and did what they are used to. The Merengues played with four attacking players (Kaká, Di Maria, Cristiano Ronaldo and Higuaín), but unfortunately, that didn't allowed José Mourinho side to create many dangerous plays. Time was on Barcelona's side, as the first leg big advantage allowed them to be very calm throughout the entire game. Real Madrid fought bravely, but Barcelona's tiki-taka style, physically wasted the Merengues players and a direct consequence of that was the appearance of large spaces between Real Madrid lines. A few minutes after the second half started, Barcelona took the lead, after a great pass by Andres Iniesta, allowing Pedro to score the first goal, having only Iker Casillas left to beat. However, Real Madrid reacted ferociously and 10 minutes later, Di Maria's shot hit the post, and in the rebound the Argentinian assisted Marcelo for the draw. There was still enough time to attempt the "Remontada", but Barcelona managed to hide the ball and played with the clock for the remaining time. Just like the other three "Clasicos" of the last days, Cristiano Ronaldo didn't get the opportunity to have the ball on his feet for many times, as well as Higuaín and Kaká, which certainly reduced Real Madrid chances to attack Barcelona. The match would end without any further big incidents and Barcelona is through to the UEFA Champions League final, where they will most likely meet Manchester United, if the English side succeed to defend a 0-2 lead, achieved last week in Gelsenkirchen. On a side note, "Jimmy Jump" (also known as "El Saltador") striked again and breached security in half time, just before the second half started. Jimmy Jump target was Cristiano Ronaldo and this pitch invasion was succesful since he managed to touch CR7. Jimmy Jump was wearing a shirt with a tribute message to Eric Abidal. You can watch Juventus live stream, the photos here. Remember that you can watch Sevilla vs Real Madrid livestreams, for the Spanish League, online here on ronaldo7.net, this Saturday. Cristiano Ronaldo will probably play, but news on this matter will released later on this week.